I know there is another box of red wine on this boat, but I can't find it. I know because we had a boat party and everyone, knowing our predilection for Chateau Le Box, brought us a vintage in a rather lame but much appreciated attempt to be funny. This was amusing with the first box, delightful with the second, but by the fourth box of Cabernet I was beginning to think the whole thing was getting out of hand. For one thing, I had clients who planned to swing by the boat during the Open Boat Party (similar to an Open House Party without the plants), and it just wouldn't do for them to see a lineup of wine boxes at the back of the salon like soldiers on parade. So I stashed them. I slid them into a cubby. A stowage area. A cupboard under the seat. And while I have frequently bragged about the delightful fact that our Lagoon catamaran can play host to a game of hide-and-seek during which the children can actually lose one another, not finding a glass of wine when one needs it is skating perilously close to disaster. Yet it is true that one of the single biggest advantages to catamaran living is also its bête noire. 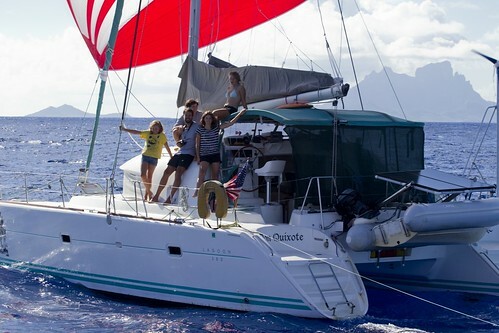 A catamaran offers two to two-point-five times the living space of a comparable length monohull. This makes a catamaran the ideal cruising platform for a family. I recognize and admire the many couples sharing their 40-foot seaworthy cruisers, using one cabin for sleeping and another for guests. But when you travel with your own army, you must find places to put the foot soldiers. A second hull is an outstanding place to stash the children. On our boat, there is Our Hull and Their Hull. This breeds a form of harmony in our family unit that is hard to overstate. Yet the problem with all that lovely space is that catamarans are notoriously inefficient when overloaded. For every 1,000 pounds you add to your catamaran in the way of water, food, offspring and assorted beach equipment, your boat drops into the water another inch. If speed is safety, weight on a catamaran is risk and waste. The temptation to stow all that and a bag of chips, however, is amazing. Everywhere you look, the boat offers up a new and more enticing opportunity to take it with you. In our boat, we have all that lovely space under the bunks, seats and floor boards. Not to mention the cabinets, the custom shelves Dr C installed, and all the spacious room in the lazarettes. But the place we really start to get lost, both figuratively and literally, is in the bow lockers. The starboard locker is seven feet deep, about eight feet long and split level. I could hide a dead body in there for a month and no one would notice... though I'll grant you that in part this is because we still use the holding tank. One dead smell is a lot like another. I remember the first few weeks of my trans-America bike tour vividly. We carried all our own gear so the bikes were quite heavy. By the time we got to our first post office five days into the trip, I was ready to concede that most of what I carried was completely unnecessary for my survival. In fact, the opposite was quite literally the case. If I was going to make it across country, I needed to shed 15 to 20 pounds which I promptly mailed to my husband-to-be. Two months later, a five-pound pack of trail mix arrived from my mother. In a hurry, I dropped it into a forward pannier. I found it three weeks later. Whoops! By that time, you could have bounced quarters on my calves and I really didn't care what was on the bike. The boat is like that. You can drop something into a locker, and it'll disappear. It is only when you are faced with a truly significant obstacle – for example, dinner without a glass of vino – that you start to prowl around and discover all the things that you have tossed into lockers over the months and you can’t remember when or why. Tonight's exploration has thus far yielded the following: 40 feet of net which I feel someday would appropriately be hung from the life lines to prevent our children from going overboard; a spare parts kit for the head; a new Whale Gusher foot pump I plan to someday install in the galley; eight pencils, including their little nubby-end erasers; and a partridge in a pear tree. And while I have yet to find the wine, I did find the spare bottle of rum and a bunch of tired but still serviceable limes. Good things come to she who searches.